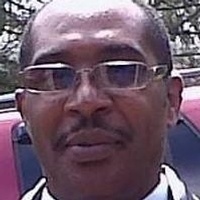 Paul Edward Poore, Jr, 55, passed away Wednesday, February 20, 2019. Paul was a native of Asheville and a son of Paul E. Poore, Sr. and the late Patricia Lyles Poore. Paul was a 1981 graduate of Asheville High School and was a state champion wrestler for his team. Paul was employed as a Certified Nursing Assistant at the Laurels of Summit Ridge and was loved by co-workers and residents. He was a member of the God's Ray of Hope Church. He was an avid sports fan and a very kind, fun and loving man. In addition to his father, Paul E. Poore, Sr., surviving family to cherish his memory are his wife, Gina Stevens Poore; sons, Isaiah Poore and Stephen Barnard; daughters, Kayla Poore and Jalyn Stevens; sisters, Tina Poore, Duwanna Hallum-Daniels and Sheila Whitner; several nieces and nephews; other relatives and friends. Funeral service will be 1 pm, Monday, February 25, 2019, Mt. Zion Missionary Baptist Church with Apostle Inez D. Ray officiating. Burial will be in Sunset Cemetery. The family will receive friends at 44 Lancelot Ln. Acknowledgments maybe received at rayfuneralcremation.com.